Store Street (or Shooters Brook) Aqueduct was built in Ancoats, Manchester, by Benjamin Outram in 1797, the year prior to his official appointment as the Consulting Engineer for the Ashton Canal Company. This single-arch structure is believed to be the first major skew aqueduct to be built in Britain, the skew angle being 45º The principles of construction of this type of aqueduct were not fully understood prior to this time and earlier aqueducts were built square to the crossing. In the case of this aqueduct, the skew angle is defined as the inclination of the centre line of the aqueduct to the normal of the centre line of the road. When constructed, it carried the Ashton Canal over Shooters Brook but today this lies below Store Street. This aqueduct is Grade II* listed, List Entry No. 1270666, date first listed 6 Jun 1994. Store Street Aqueduct, Ancoats, Manchester, 31 May 1980. 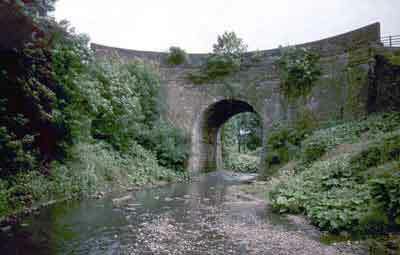 Tame Aqueduct in Ashton-under-Lyne carries a short branch of the Ashton Canal across the river Tame into Dukinfield, where it makes a head-on junction with the Peak Forest Canal. The three arches of this squat structure are semi-elliptical in form, because of the limited headroom, and they rest on rectangular piers with rounded ends. Four pilasters, one above each pier and one on each abutment strengthen the side walls. This aqueduct is Grade II listed, List Entry No. 1356423, date first listed 6 Feb 1986. 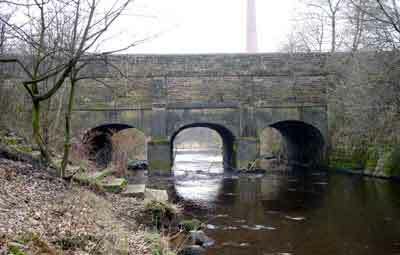 Tame Aqueduct, Ashton-under-Lyne, looking downstream, 4 February 2006. Waterhouses Aqueduct is a single-arched structure on the Hollinwood Branch of the Ashton Canal. It is curved deeply inwards in plan, the walls are battered and there is a buttress on each abutment. The deep curvature of the walls form arches in plan and this enables it to resist both water pressure and earth pressure from the steep banks of the river Medlock. This aqueduct is Grade II listed, List Entry No. 1356454, date first listed 6 Oct 1987. Waterhouses Aqueduct over the river Medlock, Daisy Nook, looking upstream, 11 June 1983. 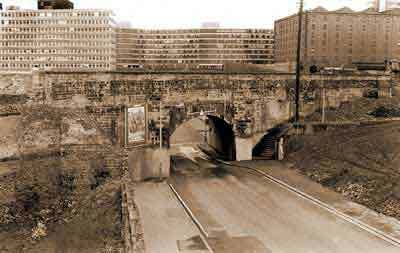 Iron Aqueduct is a single-arched aqueduct at Daisy Nook on the Hollinwood Branch of the Ashton Canal. It is a single-arched structure and it is curved inwards in plan and the walls are battered. The canal is carried across it in a cast-iron trough, which can just be seen beneath the arch. The stone tablet in the parapet bears the date, '1859'. 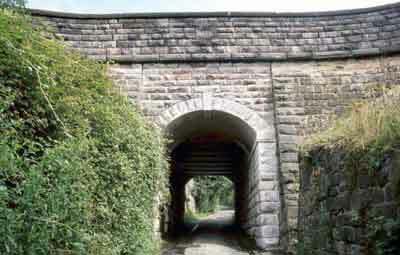 Iron Aqueduct over Crime Lane, Daisy Nook, August 1983.